The Tour Down Under has just finished. Ordinarily it wouldn’t appear on European cycling radars, but this year was different. Lance Armstrong was in it. It’s weird that he’s making a comeback, but also pretty weird that he’s riding in something other than the Tour de France. He’s specialised in one race at the exclusion of everything else. Let’s hear it for Allan Davis, the Australian winner of the TDU (What would Stephen Fry say?). We raised a glass of YellowTail Pinot Grigio 2007. An oddity. Pinot Grigio from Australia? From a mass market brand? Why? It was surprisingly good. I expected a candy concoction, but this had citrussy nuttiness with just a smidge of pineapply peachiness, but not an overly disturbing amount. I bought it because it was on sale, and I had a coupon, so it cost me about £3. I expected it to be worth about £3, but I’d happily pay £5 and wouldn’t feel gouged at the regular sticker price of £6. Given a free choice, I’d probably still pick a random Italian Pinot Grigio and run the risk of something thin in the hope of something sublime. If you’re looking for something more reliable, this is probably a safer choice. 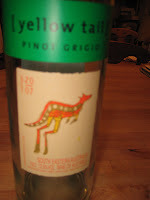 Tried to stay away from Yellow Tail Pinot Grigio because I have never been impressed with their reds. Was forced into it not long ago and since it has become a favorite of mine. Enjoy it almost every week with broiled fish.